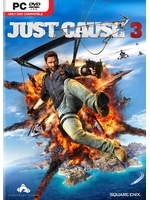 Launching June 10, a week earlier for Expansion Pass holders, the Mech Land Assault pack for Just Cause 3 will put Rico on Lacrima Island where he will be able to pilot two types of Mech for the new missions and challenges. The last content pack Bavarium Sea Heist will be made available at the end of the Summer. • Pilot two types of powerful Mech and drive them anywhere in Medici. • Unleash the Mech’s Gravitational Remote Influence Projector or “GRIP” to attract and hurl objects at your enemies. • Jump and smash helicopters from the sky or ground pound tanks with the GRIPS’s “Force Pulse” attack. • Prove your skills and earn upgrades in Mech arena challenges. • Call in a Rebel Mech buddy for extra firepower when the going gets tough. • Includes a powerful new energy weapon, the Bavarium Power Core rifle. Just received a 1.04 patch, hope it'll actually fix some issues. The game is fun, but it's glitchy and has really bad performance on PS4. Really hope the game starts working for me so I can play this. I really really enjoyed the game and it was pretty much flawless for me on PC, awesome performance and a ton of fun, no real bugs, until it started hard locking my PC every time after a few minutes of play.